When it’s time for kick-off, how do you show your team colors? Football fashions have been around as long as, well, football itself. In the 1880s and 1890s, fans going to a game pinned colored ribbons to their lapels to show which team they supported, though the guys often sported longer ribbons to be sure they’d have extra to share with a pretty girl who had none. By the 1950s, ribbons were still being worn, though though they were more popular with the co-eds. 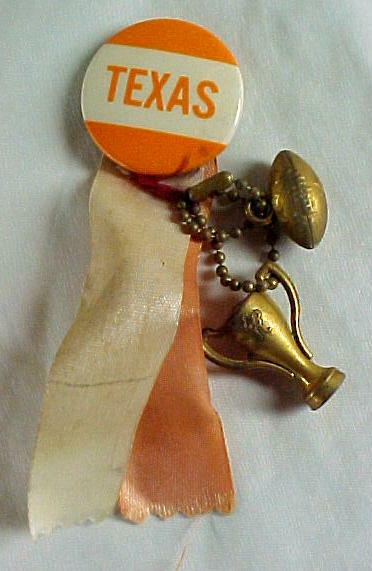 Some were solid color ribbons attached with a team button (see photo at left), and perhaps decorated with “football charms” – tiny footballs, helmets, megaphones, or trophies. Above, from left. 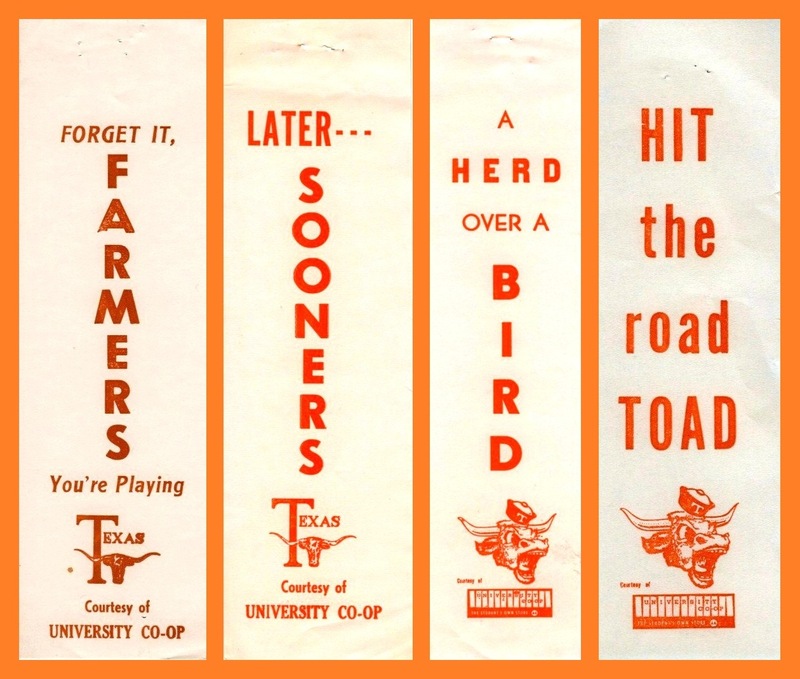 Paper ribbons used for home games against Texas A&M, when the annual Thanksgiving Day game was often billed as the Tea-Sips vs. the Farmers, rather than Longhorns and Aggies; Oklahoma Sooners (Who else? ); Rice Owls; and the TCU Horned Frogs. 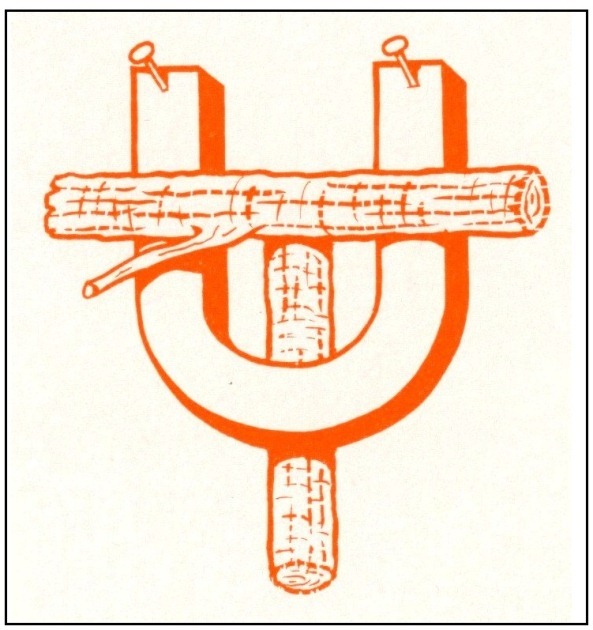 The “T” and longhorn logo at the bottom was used for only a few years in the early 1950s. The “yelling Bevo” icon was first appeared in 1953. Above, from left. 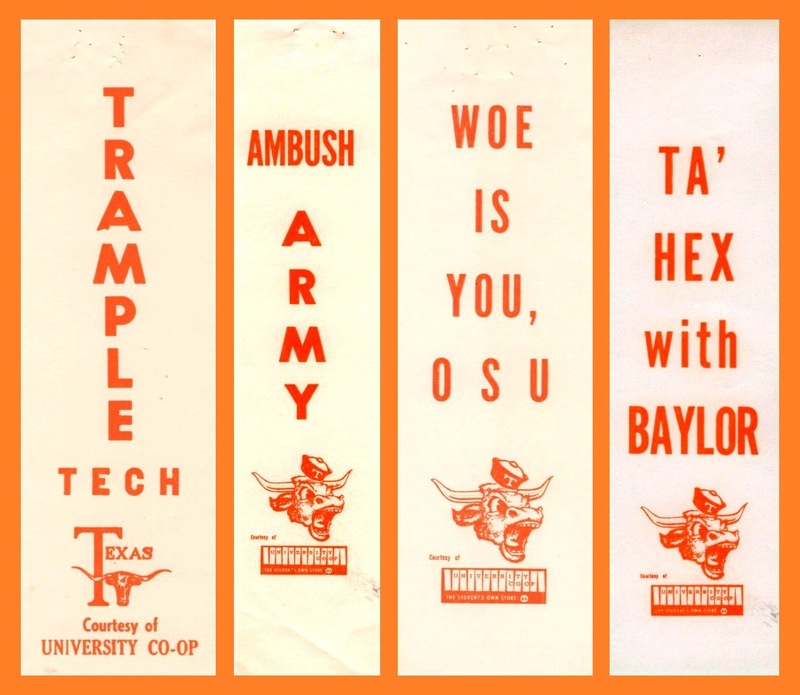 An early 1950s ribbon for a Texas Tech game; from the 1964 Texas vs. Army bout in Memorial Stadium (UT won 17-6. ); Oklahoma State was a non-conference opponent in 1963, when Texas went undefeated and claimed its first national football championship; in 1953, third ranked Baylor came to Austin, but UT students had been burning red candles to hex the Bears. Baylor fell 21-20. Above, from left. Click on an image for a larger view, and you can still see the holes at the top where the ribbons were pinned. 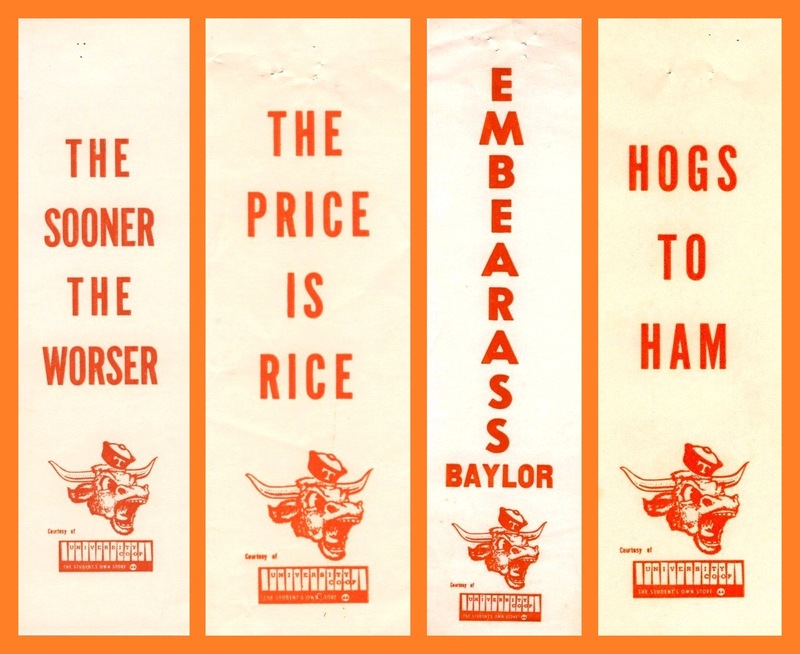 These are from the 1950s and 60s for games against Oklahoma, as well as Southwest Conference opponents Rice, Baylor, and Arkansas. This entry was posted in Uncategorized and tagged 1950s, football, Jim Nicar, Longhorn, ribbon, Texas by jimnicar. Bookmark the permalink. Those were fun! I’d almost forgotten about those ribbons. Don’t think I ever had a ribbon at UT but I certainly did at my elementary and high school. Great post! !